I remember the first time I ever spoke in front of an audience. With a shaky voice, nervous body posture, and a speech that seemed to drone on for hours I walked off the stage vowing to never make that mistake again. Since then I have stood in front of countless audiences, not as a shaky scared presenter but rather armed with some time-honored tools that, when put into practice, will leave the audience on the edge of their seats wanting more. No matter what your audience looks like there are three key qualities that every great presenter should embrace. These qualities will leave your audience feeling engaged, equipped, and empowered to take what they have heard and do something about it. STAND UP. So they can see you. Did you know that 55% of all communication comes through nonverbal cues? In fact, according to a study conducted by Dr. Albert Mehrabian, author of Silent Messages, he found that only 7% of any message was conveyed using words. 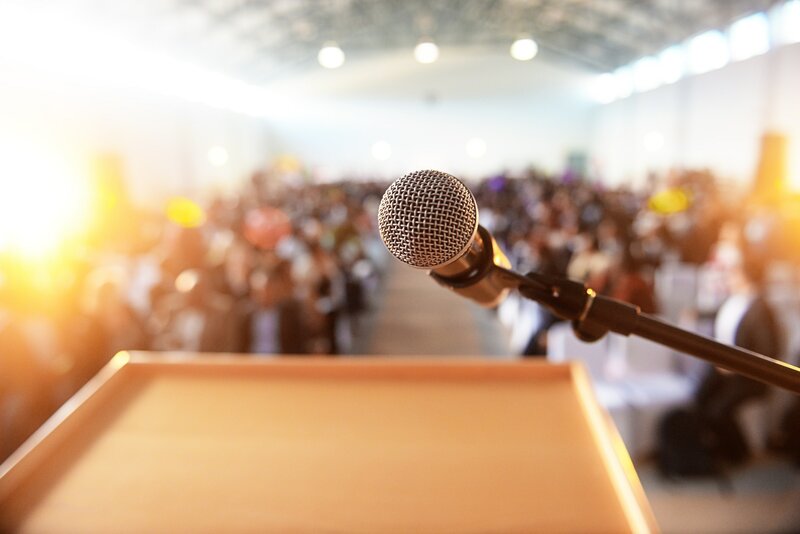 With such a high percentage of all communication coming through non-verbal cues, we must become experts at our body and what it is doing during a presentation. There is nothing worse than a boring presenter who stands with a slouch or a nervous presenter who is always fidgeting with their wedding ring. However, there is nothing more engaging than a confident presenter who stands tall and delivers with clarity. Maintain prolonged eye contact. Use your eyes to draw someone in to your presentation. Eliminate any nervous tick. Use the nervous energy to create excitement, not distraction. If you can master your body language, you can not only become a better presenter, but an overall better communicator. SPEAK UP. So they can hear you. While Dr. Albert Mehrabian found that 55% of all communication comes from nonverbal cues, he also found that 38% comes from vocal cues. When I use the word vocal cues, I don’t mean words; what I mean is the actual pitch, volume, and cadence of your speech. We have all been there, sitting in a room listening to a presenter that sounded more like the teacher from Charlie Brown than we care to remember. The monotonous drone of the presenter’s voice begins to lull us to sleep and, in an effort to keep our eyes open, we begin to daydream about our next vacation. This is a perfect example of poor vocal variety and the damage that it can cause to any presentation. 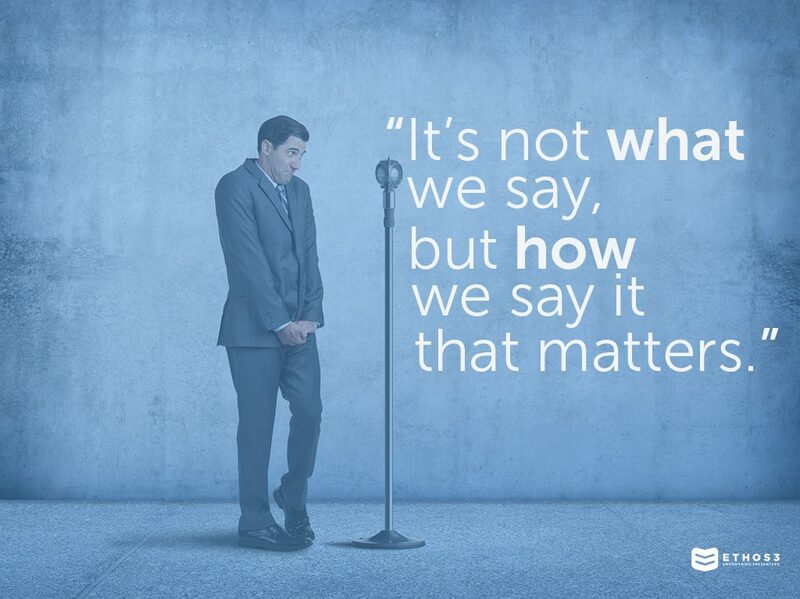 More often than not, it is not what we say, but how we say it that will stick with a person, because the way we say things elicits an emotional response. Cognitive psychologist Dr. Donald Mackay found that the stronger the emotional response to a word, the more likely a subject was to remember it. So why not take advantage of this simple psychological reality and capitalize on it as presenters? As presenters we must learn to control the room with the tone of our voice. Increase volume. By raising the tone of your voice, you have the ability to create excitement and energy around your comment. Slow down. When you slow down the cadence of your voice, you draw in the audience communicating importance. Watch your pitch. There are certain frequencies that are just harder to listen to than others. Make sure to control your pitch to keep your audience listening. SHUT UP. So they’ll listen to you. As of 2013 the average undivided attention span of a human was 8 seconds — that is 1 second less than the average goldfish. As sad as this reality is, we cannot ignore it when it comes to presenting, because as good as your content is, or as clear as your communication is your audience cannot pay attention for long. The biggest mistake I see in presenters today is the desire to pack a ton of content into a presentation which leaves them droning on until the entire audience is checking their Facebook feed. Even those in your audience with the strongest ability to stay engaged will begin to disconnect after 20 minutes of straight talking. The human brain is just not able to stay engaged for that long, and from the 20-minute mark on will retain less and less information. Clarity is your friend when it comes to presenting. These vital seconds can make a lasting difference in your audience’s ability to stay connected and excited about what you have to say. Know your content and deliver it. Preparation is vital when it comes to clarity. If you don’t know your content you will waste time trying to remember instead of connecting with your audience. Nail your transitions. Transitions are one of the toughest parts of a presentation. Be sure to rehearse these ahead of time to avoid repeating and rambling. Keep the flow. There is nothing worse than confusing content that seems to jump from one thought to another. As a presenter, be sure your presentation flows smoothly and makes sense. Becoming a great presenter takes time. It doesn’t just happen overnight, and like my first time on stage, it comes with some mistakes along the way. If you can begin to master these three qualities you will find that what was once daunting can become a powerful tool to move your company, product, or brand forward. If you’d like to learn a little bit more about who you are as a presenter, check out the Ethos3 badge assessment.